This zap cane has 1 million volts of output power to protect you on your walks. The bad guys may think its just a cane to help you get along, but with million volts at your disposal you can make them quit the area, pronto. Made by the same ZAP factory that makes the great flashlight stun gun, now make a tremendous stun taser cane with flashlight. Wonderful execution of this stunning concept of cane, light and stun weapon all in one to defend yourself against attack. 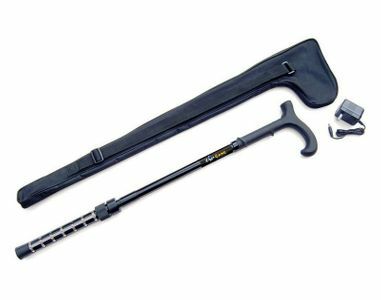 The cane is light weight and sturdy (supports up to 250 pounds). The stun can is adjustable for your comfort and comes with a charger. Just plug in when you first get it, for 6 hours, and you are ready to go. Appears to be a walking stick or gentleman's cane like any other with a gloss black finish and rubber tip. The metal bands on the business end of the cane are where the output happens. Just reach out and touch those bands to your target and press the trigger to apply the 1 million volt current. Note: We do not ship stun guns or tasers to IN, HI, MA, MI, WI, RI, NY, or outside the USA. Also we cannot ship stun guns to Chicago, IL.,Denison, IA. WI allows sale with copy of Concealed Carry Permit. You may fax to us at 888-345-2533. We can ship a stun gun to IL (but not Chicago) if you fax your current FID card to us at 888-345-2533. We can only ship this item to the billing address of the purchasing card. 1 Million Volts - Adjustable 32-36" Long , Weight Capacity - up to 250lb - With Ultra-bright LED Flaslight - Safety Switch , Built-in Rechargeable Battery - 1 Year Manufacturer Limited Warranty $20.00 Carry Case included for FREE! Shipping is $7.95, but if your order is $99 or more shipping is only $3.95! Beware those with lower product prices but higher shipping costs not provided until you order. completely satisfied.They will be my first choice for any future purchases.